Breast Cancer Rate Is Now the Same for Black Women and White Women. The American Cancer Society recently reported that black women are now getting breast cancer at the same rate as white women. This was not so in past years. The breast cancer rates in black women previously trailed that of white women. In the states of Alabama, Kentucky, Louisiana, Mississippi, Missouri, Oklahoma, and Tennessee, the rates for breast cancer in black women recently exceeded that of white women. During the time of the study, from 2008 to 2012, the incidence rates of breast cancer increased in black women at 0.4% per year and stayed a constant in white women. Breast cancer rates became equal between black women and white women in 2012 because of the increased incidence rates of breast cancer in black women and stable rates in white women. Black women continue to die from breast cancer at higher rates than white women. Breast cancer death rates have increased over time. As recently as 2012, death rates were 42% higher in black women than white women. Study authors say this is likely to continue given the increasing rise in breast cancer incidence rates in black women. Earlier reports from the American Cancer Society and other studies continue to find that black women have the highest breast cancer death rate of any racial or ethnic group. Black women are often diagnosed at later stages than other ethnic groups and tend to have the lowest survival at each stage of diagnosis. Some of the reasons given for this are lack of access to regular screenings and follow-up, as well as limited access to high-quality treatment. Another contributor to the higher death rate among black women is that they often have aggressive, harder to treat tumors such as estrogen receptor (ER) negative tumors. In another press release, the American Cancer Society reported that an analysis of nationwide data finds that no matter what their socioeconomic status, black women are almost twice as likely as white women to be diagnosed with triple-negative (TN) breast cancer, which has a poorer prognosis. Triple negative breast cancers usually grow and spread quicker than most other types of breast cancer. Other health issues, such as obesity, are considered a risk factor for breast cancer for all women whatever their race or ethnicity. 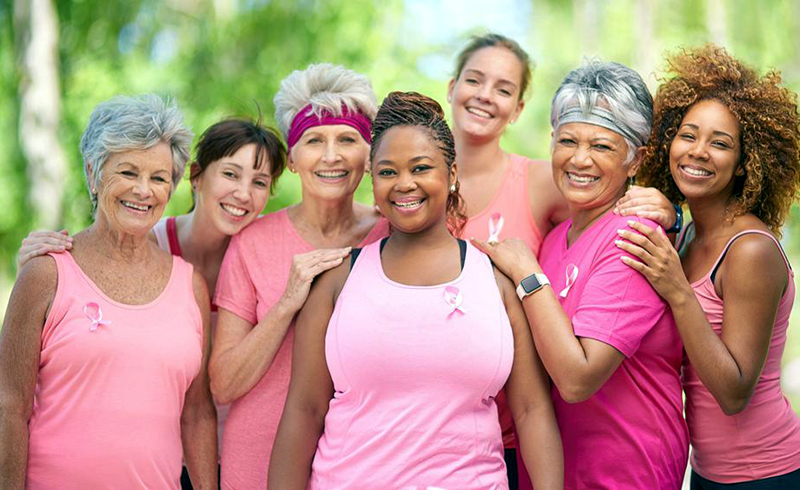 New studies support the fact that obesity increases the risk of the most common type of postmenopausal breast cancer in black women. Where you receive breast cancer care matters; so does when you seek care for breast cancer. These two factors play an important role in the widening gap between the rates of survival in black women and white women. Black women need the earliest possible detection and intervention activities. Mammograms, especially digital mammograms, are still the best tool we have for catching a breast cancer while it is small, treatment is easier and a patient can tolerate it better. Early detection and intervention offer the best chance of survival. The American Cancer Society’s new recommendations for mammogram screening guidelines pushed back screenings for all women, of average risk, to 45 years for beginning mammograms. They also recommended that after 55, women can get screened every other year. Women with risk factors need to be their own advocates and err on the side of caution by beginning screenings at 40 and not 45, and having mammograms yearly. Being a cancer navigator, meeting with women with late-stage breast cancers, has convinced me of the need for neighborhood-based breast cancer awareness programs educating women about their risks and linking them to screening programs and treatment providers. Medicaid and Medicare make screening and treatment possible for those in need and those who are 65+ or are disabled. Affordable Care Act coverage provides no cost or low cost preventative screenings such as mammograms.